Endocrine disrupting compounds enter the aquatic environment primarily through the discharge of treated and raw sewage and are detrimental to aquatic organisms even at subnanogram per litre levels. In the majority of North American and European cities wastewater treatment plant effluent is indirectly re-used, through discharge into rivers which are also a source of drinking water. Consequently, there is the possibility that trace amounts may enter into drinking water even after special treatment processes. Several hormones (estrone, estriol, 17-ß-estradiol, equilin, androstenedione, testosterone and 17-a-ethynylestradiol) are routinely monitored by the US EPA in drinking water as part of the Unregulated Contaminant Monitoring program (UCMR3). This technical report describes an optimized approach to the direct analysis of hormones in water regulated by EPA Method 539 and UCMR3. 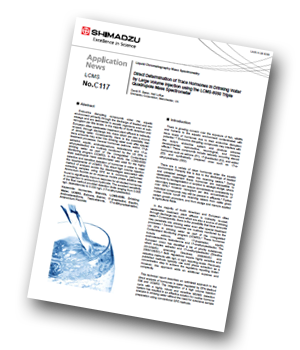 The integration of a high volume injection cycle with a highly robust and sensitive MS/MS detection system has resulted in an effective solution for routine hormone analysis in drinking water without the need for extensive sample preparation using conventional SPE methods. In this study ammonium fluoride was tested at different concentrations (0.1, 0.2, 0.3 and 0.5 mM) in the aqueous phase, with methanol used as the organic phase. Improved response was observed for all hormones using ammonium fluoride, in comparison to ammonium hydroxide. The optimum concentration was determined to be 0.15 mM which is consistent with the results of others. Ammonium fluoride (approx. pH 6) offers further benefits in comparison to ammonium hydroxide (approx. pH 9.5) as the lower pH means that analytical columns, other than those stable at high pH, can be employed. is in accordance with UCMR3. The LCMS-8050 triple quadrupole mass spectrometer method delivered high sensitivity with detection limits ranging from 0.005 ng/L (testosterone) to 0.330 ng/L (17-a-ethynylestradiol). Correlation coefficients for all compounds were greater than 0.999 and peak area repeatability was determined to be typically less than 5% RSD at ‘low’ (corresponding to the reporting level) and ‘high’ concentrations.